US, 1970, 135 minutes, Colour. Burt Lancaster, Dean Martin, Jean Seberg, Jacqueline Bissett, Van Heflin, Helen Hayes, George Kennedy, Maureen Stapleton, Dana Wynter, Barry Nelson, Lloyd Nolan, Barbara Hale. Airport is what popular commercial cinema is all about. Despised by the critics, well paid for at the box-office, it was nominated for a number of Oscars (Helen Hayes winning Best Supporting Actress for 1970). Airport is easy to look at, full of magazine human interest and suspense and does not intend to do any more than that. To that extent, it is a well-made piece of Hollywood cinema. Full of characters and relying on a certain number of basic human situations, the film readily lends itself to discussion even at levels deeper than the film itself. 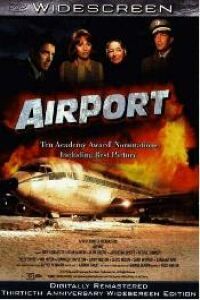 Popular novelist Arthur Hailey (Hotel) wrote the original novel, a group of star perform undemanding roles rather well, although Van Heflin and Maureen Stapleton stand out here, and Boeing supply a damaged but safe jet. 1. Airport - did the running of the airport, the intricate arrangements for the clearing of the runway, security checks, impress you with the technological improvements in our civilisation? 2. But, with all the technology, what role do people play with their planning and ingenuity, but also their courage and enthusiasm - clearing the tarmac, bringing the plane in, etc? 3. How probable was the story? How safe are planes and how often do such incidents happen in proportion to the number of flights there are? Comment on the discipline and control shown in overcoming a tragedy. 4. Guerrero - why did he act as he did? Why did he have a sense of failure? Did he love his wife? Why did the customs inspector notice him? 5. Mrs. Guerrero - was she convincing? Why - did she ask people's forgiveness in the end? 6. The head of the airport - why was he so dedicated to his work? Why did his marriage fail? Was it his socialite wife's fault? Why did Tanya Livingstone love him, offer him sympathy and share his interests? What should he have done about his marriage? 7. Vernon Demarest - his character? How irresponsible in his own life? How critical of the airport authorities? Did he rise to the occasion in the crisis? Did he really love the hostess and her baby? What should he have done about his marriage? 8. What was the point of the stowaway - mere comic relief? Showing how people can get away with it? How did she help in the crisis? 9. The hostess - how typical was she of working girls? Her affair and the baby? Was she right in going ahead and having the baby? 10. Did the crew do the right things in trying to get the bomb from Guerrero? What did you think of the interfering passenger who made confusion when he called out about the bomb?